Think YOU make a big pot of gumbo for the family during the holidays? You You ain’t seen nothing yet. 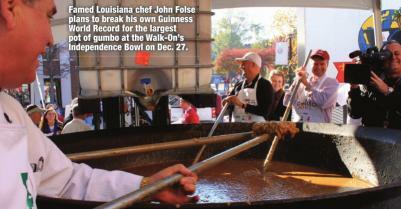 At this year’s Walk-On’s Independence Bowl, famed Chef John Folse will try to break the Guinness World Record for the largest pot of gumbo ever cooked. The 43rd annual and 11th oldest post-season football game will kick off Thursday, Dec. 27, at 12:30 p.m. in Shreveport’s Independence Stadium. However, the action will start early that morning outside the stadium – in the Walk-On’s Tailgate Area. That is where Chef Folse will begin his effort to break the current record of 5,800 pounds of gumbo. Ingredients will be put into a special pot being made by a sheet metal company in South Louisiana. Chef Folse has done this before, albeit on a smaller scale. Before the 2011 LSU vs. Alabama game, he broke the then-world record by cooking a pot of gumbo which weighed 3,700 pounds. As you can imagine, this is not a run-to-the-store-at-the-last-minute type of endeavor. This will not be a one-person effort, as you can help Chef Folse try to break the record. For a yetto-be-determined donation, you will be able to put some of the gumbo’s ingredients into the pot. You can also buy a bowl of gumbo for $5. All proceeds from the record-setting attempt will go to Fisher House Foundation, a non-profit organization selected by Walk-On’s. The gumbo event is something new – part of a concerted effort to raise the level of bowl day – and bowl week – events. A new standard needs to be set, Giglio said, because fans now expect more action than what takes place on the field. Shreveport is one of the smallest cities to host a bowl game. 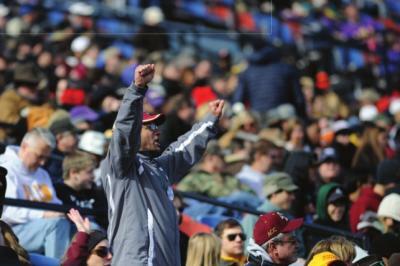 However, Giglio says that doesn’t have to mean a small-time game day atmosphere. It’s also a big deal that this year’s game will be played two days after Christmas. The Big Game Show is relocating to Municipal Auditorium. “We think that move will be very neat for the teams to experience the Municipal just because of all the history that’s in that building – a lot of history for Shreveport,” Giglio said. The event, which costs $5 to attend, features coaches and players taking part in game show-style competitions. floats – along with the participating teams’ bands – will roll from the Louisiana Boardwalk in Bossier City, across the Texas Street bridge into Shreveport, down Texas Street and back to Festival Plaza. “A lot of these floats will be new and updated for the Mardi Gras season,” Lewis said. The Block Party in Festival Plaza will be bigger than last year. “This year, we tried to get a band (Parish County Line, a country music cover band from Baton Rouge) that has a little more recognition – a higherlevel band,” Giglio said. The concert will follow the annual Pep Rally and Battle of the Bands. Having two teams play in the game which all of the community will embrace is a little harder. “We try to strike a balance of a match-up that is of local interest but also national relevance,” Giglio said. “It’s important that we strike that balance. This year’s game – televised by ESPN – will have a potential audience of millions of people. That means three-and-a-half hours of national television exposure for Shreveport-Bossier. In 2017, Walk-On’s Bistreaux and Bar – based in Baton Rouge – signed a five-year agreement to be the Bowl’s title sponsor. However, Walk-On’s can opt out of that agreement after next year’s game. For that reason alone, it’s important this year’s game – and pre-game events – is well-attended. But Giglio insists that’s not the only reason. “Every year is important,” Giglio said. “I can tell you that we’ve worked hand-in-hand with Walk-On’s along the way in planning this year’s bowl week events, our bowl game, on everything. It’s very important. But it’s not only important because of Walk-On’s. It’s important for traveling fans and for our community because we do this game to make an impact not only on Shreveport and our region, but we do it to make our city, our brand, known to the nation. That’s why it’s important. 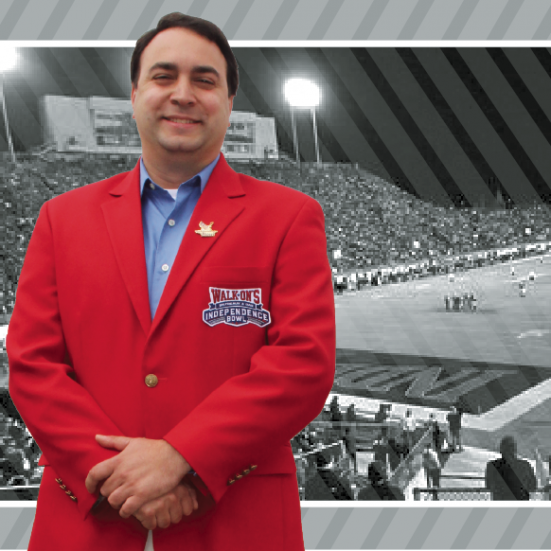 To learn more about the Walk- On’s Independence Bowl and see a schedule of events, you may visit www.walkonsindependencebowl.org.